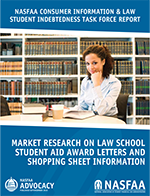 As part of a project funded by Access Group, NASFAA seeks to determine what consumer information is most vital to aiding Graduate/Professional (G/P) students, specifically law students, in making informed borrowing decisions and encouraging enrollment in and completion of law and other G/P programs. NASFAA has held a longstanding commitment to the G/P community. Two issues of increasing concern to our G/P members are G/P education affordability and student loan debt. Policymakers have responded to mounting student loan debt by requiring increasing amounts of consumer information for students. Unfortunately, this consumer information is untested and, as it is generally targeted to undergraduates, rarely addresses the unique needs of G/P students. As a result, G/P students may make poor education financing decisions and/or fail to enroll due to lack of relevant consumer information. Report One: "Focusing Federal Student Aid Websites On Graduate And Professional Students" set out to make recommendations for the StudentAid.gov and StudentLoans.gov websites that would expand their focus to include the needs of G/P students. The central recommendation of the report is for ED to create a new "landing page" to that would allow the user to personalize their experience based on their school type and/or individual attributes, ensuring that only information relevant to that particular student is provided. Software developers should develop a calculator to help students determine the amount they need to borrow while enrolled. G/P schools should move toward standardizing financial aid terminology used as well as the presentation of information, and ED should develop a portal through which information is shared with students. Additional consumer testing is needed to determine if G/P students understand basic financial aid terminology and concepts, and the terms & conditions of the financial aid offered in their award letters. G/P institutions should list Graduate PLUS Loan eligibility on a student’s award letter. On August 23, 2016, NASFAA sent this letter of recommendations to US Department of Education, Chief Operating Officer Jim Runcie.